Anthropometric measurements of severe malnourished children in Elnohoud educational hospital in West Kordofan State, Sudan. Citation: Abdelgader FR, Ahmed AI. Anthropometric measurements of severe malnourished children in Elnohoud educational hospital in West Kordofan State, Sudan. J Pub Heath Catalog 2019;2(1):1-5. The present work was conducted in Elnohoud educational hospital, West Kordofan State, Sudan. The aim of the study was to study anthropometric measurements of Protein Energy Malnutrition (PEM) among children less than five years of age. Study included 100 children diagnosed with protein energy malnutrition. The children were given the ready to use formula diets, F 75 and F 100, and ReSoMal. The anthropometric measurements i.e. weight (kg), height (cm) and MUAC (Mid-Upper Arm Circumference) and bilateral odema and appetite test were measured in order to assess nutritional status of the malnourished children according to WHO standards. Results indicated that the prevalence of marasmus was 84% among the studied group (75% age group from 13 to 24 month, 19% in >24 months and 6% in age group 6-12 months), pursued by Kwashiorkor 16% (62% in age group 13-24 months and 38% in group of >24 months). Statistical analysis showed that the average weight on admission significantly (p ≤ 0.05) different compared to average weight on discharge. Additionally, 69% of odema (+ve) patients were fully recovered after two weeks prior to admission, while 31% with odema (++ve) showed gradually improvement till discharge after four weeks prior to admission. Apparently, children with malaria only 5 patients at admission three of them recovered after two weeks of admission, while 10 patients with diarrhea, completely restored health at discharge. The 97% of children restored their normal appetite after one week of treatments, majority of children at discharge demonstrated excellent behavioral conditions, but three of them died during the treatments, the study found that the Body Measurement Index (BMI) for investigated group of Elnohoud educational hospital were ranged between 13.61-15.42 kg/M2 at admission and between 14.79- 16.66 kg/M2 . The BMI for this investigation categorized the studied group in malnourished status either at admission or at discharge according to FAO standards. Protein energy malnutrition (PEM), Anorexia test, RUTF, Therapeutic diet. Anthropometric measurements and values are closely related to nutrition, health status and others. Anthropometric evaluation is an essential feature of geriatric nutritional evaluation for determining malnutrition, being overweight, obesity, muscular mass loss, fat mass gain and adipose tissue redistribution [1-3]. Child malnutrition is internationally recognized as an important public health indicator for monitoring nutritional status and health of the population. The devastating effects of malnutrition on human performance, health, and survival today are well established . Some global analyses demonstrated that child malnutrition is the leading cause of the global burden of diseases. As a result of the increased recognition of the relevance of nutrition as a basic pillar for social and economic development, monitoring trends in childhood malnutrition has gained increasing importance in assessing this progress [4,5]. In Sudan, almost one third (31%) of children under the age of five are moderately or severely underweight. Around one third of children (32.5%) suffer from moderate or severe chronic malnutrition (height for age). Nationally, the level of global acute malnutrition is just below the internationally recognized threshold (14.8%) indicating an emergency situation . Malnutrition is a leading cause of morbidity (infections and diseases) and mortality (deaths) in Sudan and West Kordofan State. It also has long term effects on the child future as it affects the mental and educational development of the child. In addition to the phenomena costs on national productivity. Severe malnutrition affects about 18% of the children less than 5 years of age in Sudan . Therefore, the objectives of the present work were to assess anthropometric measurements of problem of severe malnutrition children less than five years of age in of Elnuhoud educational hospital, West Kordofan State. This study was conducted in Elnuhoud educational hospital in West Kordofan State, Sudan, using a cross sectional interventional prospective descriptive hospital based designed. Random sampling techniques used for the selection of children with severe malnutrition. Inclusion criteria :All children of age below 5 years admitted as severe malnutrition and fulfilling the WHO criteria of severe wasting or odematous malnutrition in the hospital. Exclusion criteria: More than 5 years old children and parental refusal to participate in the study. The study includes 100 children less than five years of age with severe malnutrition. Anthropometric measurements: The basic anthropometric measurements used in this study were weight (kg), height (cm) and MUAC (Mid-Upper Arm Circumference) in order to assess nutritional status of the malnourished children according to WHO standards. Weight: Weight was measured to the nearest 0.1 kg using requires clinical beam balance. The scale was checked and the mothers were asked to remove the heavy clothes of child before weighting . Length: The length was measured to the nearest 0.1cm by using measuring wood- board the children were measured without shoes. The child is placed, lying along the middle of board. The assistant holds the sides of the child's head and position the head until it firmly touches the fixed headboard with the hair compressed. The measure places her hands on the child's legs, gently stretches the child and then keeps one hand on the thighs to prevent flexion. While positioning the child's legs, the sliding foot-plate is pushed firmly against the bottom of the child's feet. To read the measure, the foot-plate must be perpendicular to the axis of the board and vertical. The length is read to the nearest 0.1 cm . Height: The height was measured to the nearest 0.1cm by using measuring board is fixed upright where the ground is level. The child stands, upright in the middle, against the measuring board. The child head shoulders, knees, heels are held against the board by the assistant, while the measure positions the head and cursor . MUAC: MUAC was measured using a three colored MUAC tape. MUAC less than 11.5 cm (red color) indicates Severe Acute Malnutrition (SAM). The child should be immediately referred for treatment. MUAC between (11.5-12.5) cm (yellow color) indicates Moderate Acute Malnutrition (MAM). The child should be immediately referred for supplementation. Lastly if the MUAC higher from 12.5 cm (green color) indicates that child's is normal . Body-mass index (BMI): BMI was estimated by dividing weight (kg) by height2 (m2) . Individuals whom were considered malnourished if their BMI was less than 18.5, normal from 18.5 to 24.9 and overweight if ≥ 25 . Checking for bilateral odema: Odema was checked normal thumb pressure on both feet for three seconds to estimate three seconds without using watch. If a shallow print persists on both feet, then the child has nutritional odema . Dietary treatment: Children with severely acute malnutrition were given them all each therapeutic milk (F100 and F75), Rehydration solution, RUTF (Ready to use therapeutic food) or RUSF (Ready to use supplementary food) and vitamin A when child is discharge according to WHO . Appetite test: The care taker should be washing his/her hands. The care taker should sit comfortably with child on his lap and should either offer the RUTF from the packet or put small amount on his finger and give it to the child. The care taker should offer the child the RUTF gently, encouraging the child all the time. If the child refuses then the care taker should continue to quietly encourage and take time over the test. The usually takes a short time but may take up to thirty minutes. The child must not be forced to take the RUTF. The child needs to be offered plenty of water to drink from a cup as he/she is taking the RUTF . Statistical analysis: Data was analyzed by using statistical package for the social sciences (SPSS) software version 16 (percentages and frequencies). Appropriate test to significant to the 5% level were used under supervision of formal statistician . On admission, the average weight of age group 6-12 months was (5.98) Kg (Table 1), while age group of 13-24 months was average (7.46) kg and last group of > 24 months the average weight was (9.44) kg, significant (p ≤ 0.05) differences were found between all these age groups. Also, height of all age group was average (65.04), (74.05) and (78.25) cm respectively; the average of MUAC for each age group (8.22), (9.05) and (9.92) cm, respectively. The average age for each group was 10.6, (18.4) and 31.6 months, respectively. Table 1. Some anthropometric measurements for malnourished children. Statistical analysis indicated that average weight for age groups of 6-12, 13-24 and >24 months were significantly (p ≤ 0.05) different, the same trends were found for the average heights for above mentioned children groups age, while there were no significant (p ≤ 0.05) differences found in MUAC for age group of 13-24 and >24 months, but significantly (p ≤ 0.05) differences were found in the age group of 6-12 months. These values agreement with mentioned WHO standard deviation Zscore less than -3 and UNICEF SD -3 [5,11] also these results correspondents with who found in Omdurman pediatric hospital the children with severe malnutrition the nutritional status they have not good . 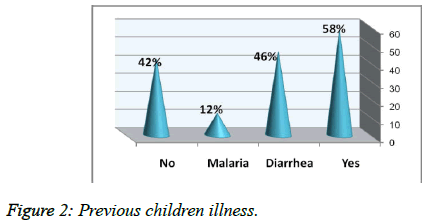 Results of the present work showed that (Figure 1) the prevalence of marasmus among malnourished children of Elnohoud educational hospital was 84%. The distribution between age groups was 6% within age 6-12, while 75% of age group 13-24 months and 19% within age group of >24 months, on the other hand percentage of kwashiorkor among malnourished children of Elnohoud educational hospital was 16%. The distribution between of age groups of 13-24 months was 62% and 38% in age group of >24 months, but percentage males suffering from odema was (62%) and females with odema was (38%), also marasmus prevalence between females was 59% and males was 41% (Table 2). Number between brackets referred to numbers of children with PEM; while percentage referred to prevalence PEM among third groups. Table 2. Prevalence of PEM among age and gender of the children of Elnuhoud educational hospital. Figure 1: Prevalence of protein energy malnutrition. At admission the diagnosis of malnutrition was based on the welcome classification of malnutrition, i.e. weight for age less than 80% of the median with odema or weight for age less than 60% of the median (Marasmic kwashiorkor) or without odema (marasmus) (5). A child was defined as underweight if weight for height was below 22 standard deviation (SD) scores (Zscores) . However, Lancet reported higher percentage of marasmus (72%) and kwashiorkor (25%) as well as lower percentage of Marasmic-kwashiorkor (3%), whereas (2) accounted greater prevalence of marasmus (92%) together with lower percentage of kwashiorkor (5%) and Marasmic-kwashiorkor (3%) among children under five years of age in Assuit, Egypt . As demonstrated in Figure 2 58% of the surveyed children had cases sickness at previous admission at hospital twice. 46% of malnourished children have diarrhea and 12% have malaria, while 42% of malnourished children were not suffering from any disease. The diarrhea is considered as a great risk leading to occurrence of malnutrition. Figure 2: Previous children illness. Many studies have indicated that gastrointestinal infection and especially diarrhea are very important in incidence of PEM , but Nabag et al. found in Omdurman pediatric hospital the children with suffering diarrhea (61%) these percentage very high, also malaria considered one of causes of risk and pneumonia (30%, 9%) respectively on the other hand in Assuit, Egypt found the water diarrhea among children (58%), while measles and pneumonia (26%, 16%) respectively [13,17]. As shown in (Figure 3) of families were drinking tap water 38% and rest respondents were 62% from dams. These finding most of respondent's family get water from dams; the means by which the water is transferred to the houses can infallible, affecting the health of the child. It shows the different sources of drinking water in the study area. It was found that only 19.2% of the household drinking clean tap water, while 69.6% of them drink tank water and 11.3% of them drink unclean surface water. Figure 3: Sources of water. It's well known that tap water is subjected to sanitary Treatment and purification before use to be safe for human consumption. Abdel Rahim stated that, surface water originates from rain water such as rivers, tanks, man-made reservoir and sea water which is borne contamination from human and animal sources, and it’s never safe for human consumption unless subjected to sanitary treatment and purification before use . 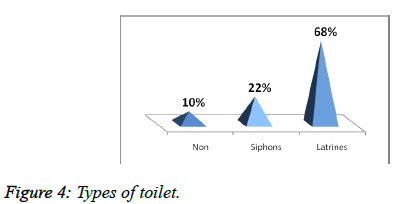 As illustrated in Figure 4, most family of the respondents are having traditional pit in their houses (68%), while 22% of family of respondents are having siphons and 10% of them of the respondents not have latrines in their houses. These finding declare the awareness of respondent's family for important of personal hygiene. Ahmad et al. shows the present of water cycle (latrines) in the house of the study area showing that 47.9% of the study houses have latrines, while about 52.1% of them have no event traditional latrines and this have the result of increase of the human feces in the environment and the is one of the most important factor that increased the level of infectious diseases among child under five years of age which is known as under line cause of malnutrition as reported by UNICEF (1995), that inadequate sanitation and poor hygiene practices are direct causes of water-borne diseases and are among the underlying causes of child deaths and illnesses from diarrheal diseases and malnutrition. Figure 4: Types of toilet. Weight: For all children investigated at discharge, the average weight for age group of 6-12 months was 6.50 kg, while age group of 13-24 months was 8.11 kg and the last age group weight was 10.20 kg, these values were found to be significantly (p ≤ 0.05) higher than the weights of sequential groups at admission which were 5.98, 7.46 and 9.44 kg, respectively due to the application of WHO ready to use rehydration solution (ReSoMal) and therapeutic milk diet in treatments of malnourished children attended to the Elnohoud educational hospital. Previously study in South African found all children with SAM they are good health when to give dietary treatment in hospital and gained weight reached to -1 SD Z-scores , also stated in Assuit, Egypt the children with severe acute malnutrition they are gained weight when discharge reached to normal weight according to WHO SD -1 Z-score . Odema: The results indicated that there were 16 children infected by odema (16 children) patient with shown odema (+ve) 69% totally recovered after two weeks, while the rest 31% with odema (++ve) showed gradual improvement till discharge at the fourth week. Malaria and diarrhea: The study showed that only 5patients with malaria at admission, three of them recovered after two weeks of follow-up, also 10 patients with diarrhea, they were completely recovered at discharge. Appetite and behavior conditions: 97% of children in Elnohoud Educational hospital restored their normal appetite after one week of treatments; whereas the rest of them have good appetite at the end of the third week prior to admission. Ten patients’ children demonstrated poor playing activities at admission, but all of them improved to excellent behavioral conditions (smile and play on mattress) after one dose of the treatments. Three children died during the treatments in Elnohoud Educational hospital that might be due to medical services and their presentation or might be due to the arrival of the child in the last stage of the malnourished disease or others conditions hidden for the authors investigations. According to of these results could be prevent child with malnourished state before discharge, it should be ensured that the parents understand the causes of malnutrition and who to prevent its recurrence, include correct feeding and continuing to stimulate the child’s mental and emotional development. They must also know who to treat, or obtain treatment for, diarrhea and other infection, and understand the importance of regular (every 6 month) treatment of intestinal parasites. Teaching of mother should regular sessions at which important parenting skills are demonstrated and practiced. Child may be considered to have recovered and be ready for discharge when the child’s weight for height has reached -1 SD (90%) on NCHS/WHO reference values . The findings of the present work indicated that (Table 3) the BMI at admission were 14.14, 13.61 and 15.42 kg/M2 for the group age of 6-12, 13-24 and >24 months, respectively. The statistical analysis revealed that there were significant (p≤0.05) differences found between groups of age for malnourished children of Elnuhoud educational hospital at admission, while at discharge the BMI were 15.36, 14.79and 16.66 Kg/M2 for the group age of 6-12, 13-24 and >24 months, respectively. Table 3. Body Mass index (Kg/M2) for malnourished children of Elnuhoud educational hospital. There were significant (p ≤ 0.05) differences found between groups of age for malnourished children of Elnohoud educational hospital at discharge. The BMI for this investigation categorized the studied group in malnourished status either at admission or at discharge according to their statements raised that individuals whom were considered malnourished if their BMI was less than 18.5, normal from18.5 to 24.9 and overweight if ≥ 25, no any obvious reasons appeared to the authors concerning these findings. The present study identifies types of children with SAM so need to be focused on during health planning and policy making related to children with severe malnutrition according to WHO standard management. Results indicated the prevalence of marasmus was 84% and pursued by kwashiorkor 16% among investigated malnourished children in Elnohoud Educational hospital. Marasmus was found to be the dominant malnutrition class in both genders males (41%) and females (59%), also kwashiorkor widespread among gender males showed slightly higher prevalence of kwashiorkor (62%) compared to females (38%). The study indicated that all malnourished children with odema (ve+) recovered after two week, while patients with odema (+ +ve) showed gradual improvement till discharge after fourth week of treatments. The BMI for this investigation categorized the studied group in malnourished status either at admission or at discharge according to FAO standards. Investigations of the applications of local foods material in the curing of malnourished children rather the ready use material is needed in a trial in future work as recommended point of view. Villareal DT, Apovian CM, Kushner RF, et al. Obesity in older adults: Technical review and position statement of the American Society for Nutrition and NAASO, The Obesity Society. Am J Clin Nutr. 2005;82:923-34. Grinker JA, Tucker KL, Vokonas PS, et al. Changes in patterns of fatness in adult men in relation to serum indices of cardiovascular risk: the Normative Aging Study. Int J Obes Relat Metab Disord. 2000;24:1369-78. Forster S, Gariballa S. Age as a determinant of nutritional status: A cross sectional study. Nutr J. 2005; 4:28.
WHO. Management of severe malnutrition a manual for physicians and other health workers. Geneva, Switzerland 1999. UNCEF. Global magnitude of malnutrition. UNCEF, Cairo 1997. Abdelrahim AA. Prevalence of protein energy malnutrition in University of Khortoum, Faculty of Agricultural, Sudan 2009. Federal Ministry of Health. Federal Ministry of Health, Government of Sudan, National Nutrition Program. Management of Acute Malnutrition. 2015; 14-35. Garrow JS, Webster J. Quetelet's index (W/H2) as a measure of fatness. Int J Obes. 1985; 9:147-153. WHO.World Health Organization: Expert Committee on physical status, the use and interpretation of anthropometric physical status, WHO, Geneva, Switzerland, 1995. UNICEF (2013).Global Evaluation of Community Management of Acute Malnutrition (CMAM): Global Synthesis report (link is external), New York, UNICEF. WHO. Management of severe malnutrition a manual for physicians and other health workers, Geneva, Switzerland, 1999. Duncan DB. Multiple ranges and multiple F test. Biometrics. 1955;11: 1-24. Nabag FO, Elfaki AE, Ahmed OK. Socio-economic and environmental risk factors of protein energy malnutrition among children under five years of age in Omdurman pediatric hospital. Merit Res J Food Sci Technol. 2013; 1:1-8.
WHO. Management of severe malnutrition. A manual for physicians and other senior health work, WHO, Geneva, Switzerland, 2002. Lancet H. Disease of Children, 3rd edition, Oxford London, Endinburgh 1970. Michael CL. Human Nutrition in the Developing World. Food Nutrition Series No.29. Rome, Italy, 1997. Ahmed AE, Elkady ZM, Hussein AA et al. Risk factors of protein energy malnutrition Kwashiorkor and marasmus among children less than five years of age in Assuit University children hospital. J Am Sci, 2011; 7:592-604. Saloojee H, Mayer TD, Garenne, ML et al. What's new? Investigation risk factors for severe childhood malnutrition in a high HIV prevalence South African setting. Scandinavian J Pub Health, 2007; 35: 96-106.